If you visit Panama city on vacation, you would do well to visit the Embera Indians in Darién province. They live as you would imagine indigenous people live, using little electricity, dressing in colorful albeit minimalist garb, and putting on a great show for tourists who are treated as well to a fantastic lunch of fried fish, caught that day. You may think that they are amazed every time they see Americans (other than Native Americans) but it turns out that these folks are quite educated, cultured, with many having traveled worldwide. They live as they are partly because they like it but also because the Panama government gives them special financial benefits provided that they continue welcoming tourists, thereby raising the chance of attracting more people to their shores than otherwise. You might think that this is corruption via money, and perhaps it is, but only a really small scale. If you want to see large-scale degeneracy, take in Cristina Gallego and Ciro Guerra’s “Birds of Passage,” or “Pájaros de verano” in the original, Spanish title. What you see here could be called “Godfather 3,” simplistic though that is, because the body count is high (most violence off screen, though) and because the various indigenous clans of Colombia’s Guajira region in that country’s northeast have gone to war with each other, most having fallen under the influence of blood money. At the same time, there is a struggle between tradition and commerce, between doing things the way they have been done for a thousand years, of falling prey to the competition and evils of modern times. 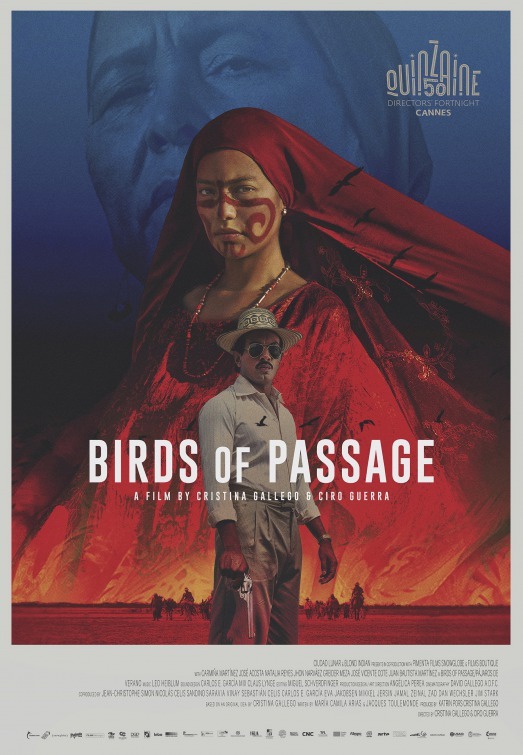 “Birds of Passage,” the title’s referring both to the one-engine planes that carry marijuana from Colombia to the U.S. for a special of fowl that have lived there at least as long as the indigenous people. Before money makes its entrance, the clan is living according to tradition. Under the guidance of Ursúla (Carmiña Martinez), a strong leader and matriarch, her daughter Zaida (Natalia Reyes) is declared “a woman,” as would a debutante in our own society. As the group dance, Raphayet (José Acosta), following a long-standing mating ritual, proposes, but the dowry demanded by the girl’s uncle Peregrino (José Vicente Cotes) is too high for the newly engaged man. Ironically, the old tradition of the dowry is to cause the conflicts which will destroy the indigenous society. The action of the movie takes place from 1960 to 1980. A clash of civilizations occurs when Raphayet and Moíses (Jhon Narvaez) run into young Peace Corps workers who are not the idealistic youths you’d expect. Their goal is to buy marijuana from the locals and have it flown back to the States, not the way our President believes that drugs are being imported by land. With the jungle-based plantation run by Aníbal (Juan Martinez), Raphayet becomes a businessman, trading in his traditional hut for some lavish digs, thereby uprooting everything the clan had stood for over the centuries. When the pilots of the one-engine planes are discovered hiding weed, thereby indicating that they are buying from other clans against their agreement, the killings begin, families fighting families like the violence prone mafia in the “Godfather” series. One cast member performs as a Greek chorus, reciting poetry and singing hymns both announcing and foreshadowing the gunplay to follow. Tradition simply cannot compete with the love of money, which is the root of this evil, in a movie that’s surprisingly slow-moving for most of the way but exploding in mayhem during the concluding scenes. This is an epic tale involving communities that most of us rarely see on the screen or in real life, an involving story that takes us step by step toward the breaking up of a rich culture.